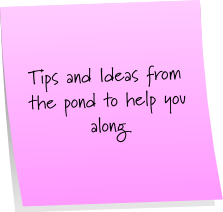 It's time for some SPRING CLEANING and even the pond needs to be cleared of the winter scum buildup! Throw open the windows, crank the tunes and let the sunshine blow in on the breeze. 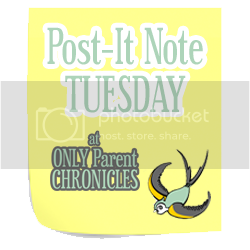 Let's get sticky with POST ITS. 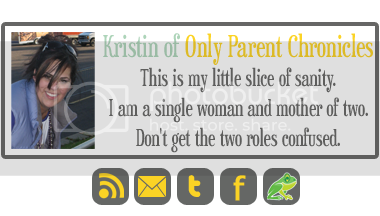 Kristin was so generous to let me take over here today. Its always easier for me to clean someone else's pond than my own. I'm addicted to organizing and vacuuming.... yes I'm for hire! 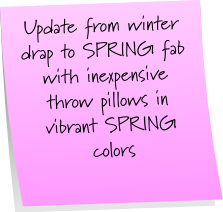 Share your tips and tricks or favorite time saving products in the comments or create your own Post Its and link up! 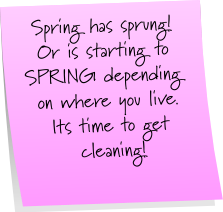 Great spring cleaning tips... especially the purging one!! I SO need to do that. This is my first time participating in this meme. I recently discovered it and love it. 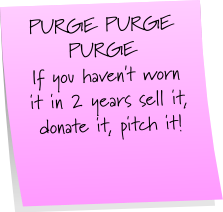 Purge, purge, purge! Love it! 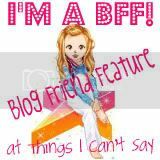 I also wrote about spring being sprung!! In case I missed this last week (I am usually pretty observant, but who knows?!) I LOVE your new design, colors, etc. So springy fresh!! I love the new design. It looks great! I have been all over the spring cleaning. It feels so good to get rid of stuff we don't need. My favorite part though is enjoying the sunshine!! Awesome advice. I'm not in the mood yet for cleaning. Love the new look! Have a great week and thanks for hosting. Great new digs K! Love the clean design! Looks FANTASTIC K!! I love the "clean" soft look! Its wonderful! great idea! im going to do that too! 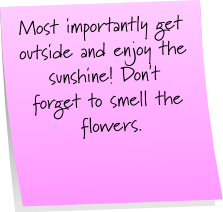 do the post it note have sth to do with spring cleaning? I am so going to need to try the newspaper thing on the windows! I'm just going to do the last one since I can't clean with Jellybean attached to me and all the kid wants to do is go outside on walks! PS - The new design is fabulous! PS your make over looks mahhhvelous here. Love it!! Damn, can't someone else come spring clean for me? And I LOVE your new look! So bright and cheery! Love the new banner and button, very spring! 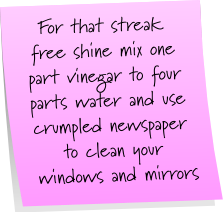 I love using vinegar and water to clean. Works great and way less toxic! 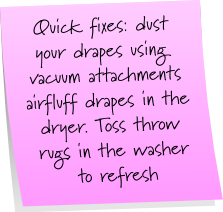 Fabulous spring cleaning tips! Loving the new look around here as well. Vinegar & water is such a GREAT idea! I use it all the time and it works like a charm!! Thanks for all the tips! I have been spring cleaning too, for the past two weeks. Have got the house to a stage where it doesn't need much to keep it clean on a weekly basis, and I can concentrate more on blogging.